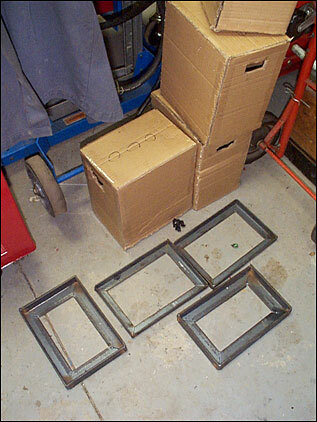 Front battery trays are welded. They'll still need some tabs made to attach them to the various points in the engine compartment, but we really need to have a welder in the garage to do this easily. So my brother and I are definitely going welder shopping this week, since the status of "Official Bottle Neck" in this project has shifted from Ivan to me. Last night I had a dream that I couldn't wait to finish the ForkenSwift, so I installed everything into a tractor and proceeded to drive around in (on?) it. Picked up 2 more batteries from the forklift company. The guy there is pretty cool - interested in the project. I've sent him a few pics of what we've done so far. It looks like he can supply us with a relatively steady stream of used batteries. I asked, and he said the company doesn't get a core refund when they get replacements - the supplier just takes away the old ones. I told him if he can keep 'em coming, I'd give him a few bucks for each one - whatever amount the recycler will give us for the dead-est ones that we reject. Of course we still haven't actually tested them to know if they're any good. But if they're only half dead, seems like possibly a good arrangement. Still haven't gone welder shopping. Need to talk to my brother tonight. Still no welder to finish the battery trays. My brother is the official bottleneck now. Today: reinstalled the potbox and calibrated the pot to the go pedal's travel. Piled 6 batteries inside the car on the floor, and started sorting out temporary cabling to hook 'em all together. The thought is: if we get the thing mobile, we can move it between our houses as needed and it'll up the convenience factor & motivation for all involved. The weather's warm enough to work in an unheated garage (heck, it's warm enough to work on the driveway now). This evening: wired the 36v string together with a hodge podge of cables of varying lengths, gauges & origins. 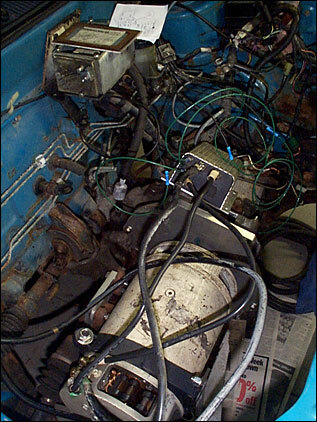 Everything from the 3/0 locomotive cable from the fork truck, to a battery-to-starter cable from a junked car. It'll be interesting to say the least whether trying to drive the car will smoke this setup ... Must make sure to double-check connections. Ran 2 cables through existing holes in the pass. side firewall, one to the motor, one to the controller. I just have to wire the controller to the pot box. ...And try out our 36v charger to freshen up the string before lowering the car and trying to move it. Definitely by this weekend. This evening: wired the controller. The system is "live" once again - and fully self-contained. 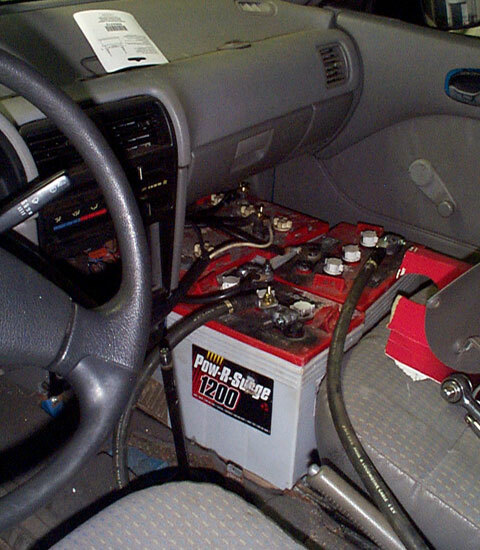 ESS inside the car this time (that's Tesla-speak for battery pack - "Energy Storage System"). I have no idea if the cabling is up to the task of delivering the current needed to move the car, but we're going to find out shortly (no pun intended, hopefully!). I'm pretty sure the car will not be able to make it back UP Ivan's driveway into the garage under its own power - it's a dirt driveway with a bit of a slope. And with the ground thawing and saturated, the cars are sinking in and making ruts. Adds a wee bit to the rolling resistance. If hillbillies made electric cars, I imagine they would look exactly like this one does right now: "ESS" on the floorboards, a snake's nest of mismatched cables, all kinds of junk car parts in the hatchback - generally a total mess inside and out! When's the first go at? We could try in the evening this week, but I want to document the milestone, so it needs to be light out. I believe only the 1231C models made that squeal. Just noticed the two YouTube vids of the motor power-ups have been viewed over 5000 times. 5314 to be exact. Amazing. Remember a while back I said the used floodies were holding their charge? I based that conclusion on the fact that the trickle charger indicator light showed "charged" whenever I moved its leads from battery to battery. They actually ranged everywhere from 4.x to 6.x volts. Doh! Anyway, today: tried out the 36v charger. Attached a "charge connector" to the ESS and let 'er rip. Man, sounded like someone was boiling pasta water in the car. ESS snakes nest inside. 4 up front, 2 in back behind the driver's seat. We have enough cable to add one more (individually charged) to the string, behind the pass. seat. 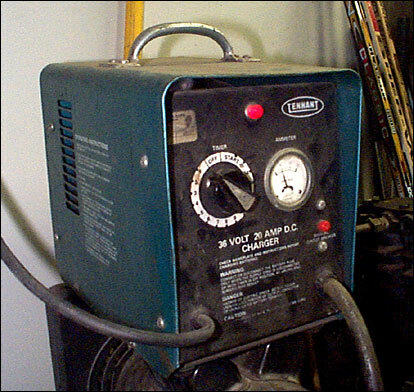 36v forklift charger. This surplus unit was donated to the cause. Courtesy of a company that had switched over to smart chargers. Why? Because people were cooking the batteries with this dumb puppy. It's got a timer, and apparently everyone set it to max time (16 hrs) all the time. Ouch. 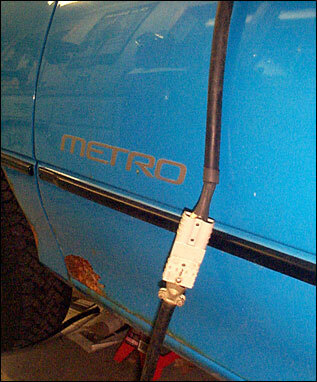 Charge connector. Think this is what you call an Anderson connector. The plan for tomorrow (?) is a dry run - still on jack stands, using the brakes to add a little load. See if the snakes stay calm, or whether they hiss and spit. Trays under construction. Well, under hiatus is technically more correct.